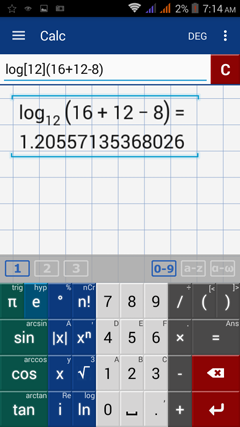 Tap the ln key once to take the natural logarithm (base e) of a number. If the argument is more than one term, write it in parentheses. Tap ln twice to use the log function to calculate the common logarithm (base 10) of a number. If the argument includes multiple terms, write it in parentheses. 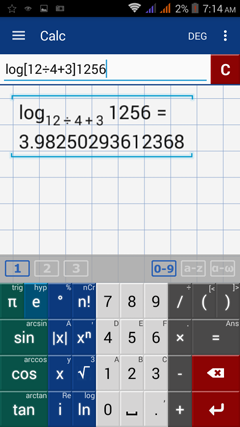 Tap the ln key three times to enter a logarithm with base 2. Note that the log2 function displays log( ) by default. Enter the argument inside the parentheses by tapping the input field. Tap the ln key twice to use the log function. 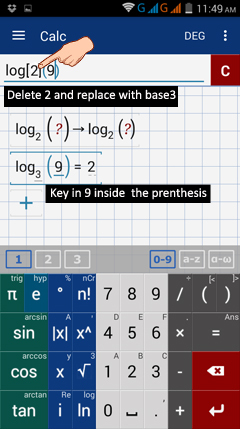 Enter the base by writing it in square brackets between "log" and the parentheses ( ). If the argument is longer than one term, write it in parentheses. For example: log9 or log(23 + 37). 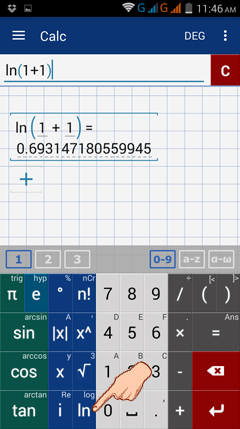 You can also tap the ln key three times to use the log2 function. Delete the 2, enter a new base in the brackets, and type in the argument in parentheses. For example: log ( ) > log  ( ) > log  ( ) > log(9). Another way to enter logarithms is by typing "log" using the a-z keyboard. Enter the base in brackets followed by the argument in parentheses. Use the a-z keyboard to type "log" and enter the base in brackets. 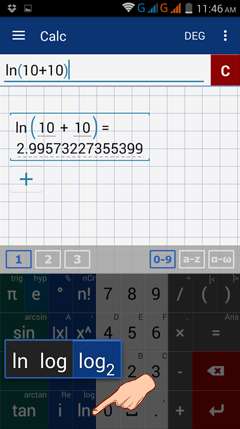 Tap the fraction bar twice to enter a division symbol ​÷. 4) Enter the argument in parentheses.